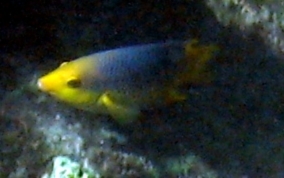 A Large member of the family of Wrasses. 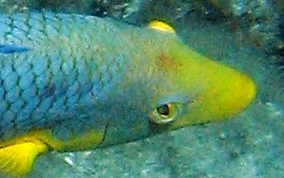 The main body color is bright yellow with a blue-purple to reddish upper body. They constantly swim around reefs in depths below 10 feet. Their piggish looking snout is probably what gives them their name. Like most wrasses, they provide a valuable "cleaning service" for large fish by removing parasites and debris.